The New York Yankees will need a lot to go right in order to be contenders for the 2015 season. CC Sabathia and his recent weight gain will have to stay healthy and effective. Michael Pineda and Mashiro Tanaka will likely have to avoid major injury, while Mark Teixeira and Alex Rodriguez try to capture glory days one last time. While bit players like Chris Young and Garrett Jones are specifically on the 25 man roster to provide depth in case of injury, there are four players who aren’t even on the 40 man roster who may offer a long-term impact for the 2015 Yankees. Here they are ranked in terms of highest upside for this upcoming season. Andrew Bailey: The Yankees have held onto Bailey despite never capturing some of his own glory from 2009-2011 when the righty was a stud reliever for the Athletics. Bailey didn’t throw a pitch in 2014 but he is healthy and ready to go, receiving an invite but not currently claiming a roster spot as we head into Spring Training. Bailey could very well find a spot in the bullpen should someone ahead on the roster chart either get injured or become ineffective and if he does, the high ceiling is potentially still there. Still, the Yankees’ bullpen is deep with: Andrew Miller, Dellin Betances and David Carpenter on the MLB roster and players like Jacob Lindgren and Justin Wilson on the 40 man roster, so it’s possible Bailey never does make it back to the big leagues. If he does, however, he showed at least moderate success as recently as 2013 while with the Boston Red Sox. Expect Bailey to be called up if he gets off to a hot start, has a strong spring or Adam Warren is summoned to the rotation. Jacob Lindgren: Lindgren stands a better chance than Bailey to make an impact simply because he’s more or less a solid start and one injury away from getting a shot. Lindgren climbed all the way to AA in his first full professional season and never really struggled anywhere. Though the 22-year-old has just 25 innings under his belt, he was earmarked as a fast climber and is a left-handed reliever, a rare commodity in the Yankees’ system in general. Andrew Miller is the lefty being tabbed to get it done in the majors, but he has a chance to struggle, anyone has a chance to get hurt and Miller may also be splitting time as a closer. Should the Yankees require a second lefty, should Miller’s role turn more towards closing or should Lindgren dominate early, he could see himself working towards a major role by the middle of the year despite not even having a spot on the 40 man roster heading into the spring. While the upside is less known and likely less important than Bailey, the chance of proving himself is higher, therefore giving Lindgren a better chance of the two relievers. Rob Refsnyder: Refsnyder is MLB ready and should Yoan Moncada not join the roster this coming week, he may find himself on the major league roster right out of the spring in some capacity. Stephen Drew‘s signing tempered expectations of Refsnyder, at least early in the year, and Jose Pirela already has a spot on the 40-man roster, but Refsnyder plays a position with one very small barrier ahead of him and he offers offense, something likely to be the biggest weakness on the Yankees’ overall roster. A homegrown, middle infielder, who can hit is valuable depth for any team, but for the Yankees it might be essential given the calculated risk of Didi Gregorius and Drew both starting the year playing everyday. Refsnyder has a chance to be called up very early even if he doesn’t make it all the way through in the spring and he may stay up the rest of the year if he continues to perform, making an impact in 2015 and beyond. Scott Baker: While it’s true Lindgren and Refsnyder have a chance to make long-term impacts and Bailey could find himself in crucial situations, the sheer presence of an innings-eating starter could make the biggest impact of all for a roster full of question marks in the rotation. Tanaka and Pineda could easily face season-ending injuries due to their elbow and shoulder respectively, while Ivan Nova is not due back until mid-season. Sabathia is recovering from knee and back injuries and Nathan Eovaldi, though a pinnacle of health in his young career, still has to recover and adjust by trying to have a rebound year and switch leagues simultaneously. With no more Hiroki Kuroda, with Brandon McCarthy going west to Los Angeles, with Chris Capuano unlikely to perform well for a full year and with Adam Warren very likely to offer even more depth in the bullpen, the Yankees sorely lack depth beyond an extremely high ceiling in its starting five. Baker, though not a flame-thrower, never an ace and largely overlooked when he was signed this winter, can offer a lot of innings out of his right arm. 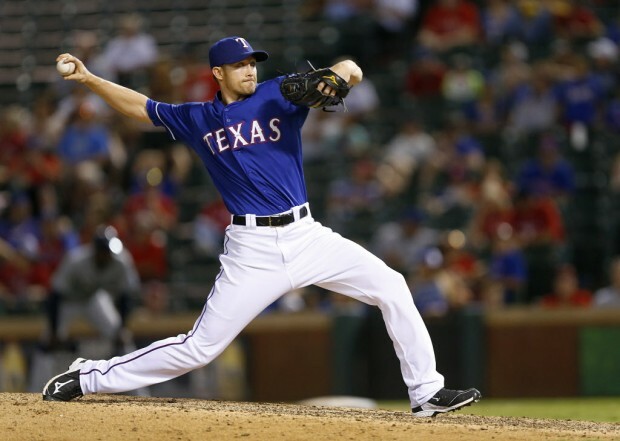 Coming off of a bad 80.2 innings in 2014 with the Texas Rangers (5.47 ERA, .262 BAA), Baker was solid every year before that, offering a 4.25 lifetime ERA and still displaying an arm capable of throwing 150 innings if necessary. At 33-years-old, Baker is still capable of reinventing himself in a role similar to Chase Whitley or Bryan Mitchell. The Yankees demonstrated the potential need for 10 or so starters throughout the year and one with veteran presence and reliability can range from a ceiling of being cut before April or playing an integral role throughout the course of the season. Refsnyder has the best chance to play this year, but it’s Baker who is likely to have the biggest impact should his name be called.